Arabella handles business while missing her husband – and being spied on by Childermas, Mr. Norrell’s servant who even intercepts messages to and from her house. She also visits Lady Pole who is still not doing well after dancing every night with The Gentleman and it isn’t helped by one of Norrell’s fanclub, Mr. Drawlight, latching on to her for gossip about Lady Pole. As she rightly describes him, he’s an odious odious little man. Lady Pole has taken up sewing – and cutting up her dresses to do so. She’s sewing “lost hope” for Arabella. Not ominous at all. She creates a tapestry of what happens to her in the hope of explaining to Arabella while reflecting how miserable she is and Arabella tries to cheer her up and promises to pass her message to her husband “the King of Lost Hope.” Lady Pole is increasingly frustrated by Arabella’s inability to understand. Stephen tries to calm her down. Drawlight was dispatched by Norrell who is curious as to what is happening to Lady Pole after his less-than-wise resurrection. He also reads their post which even Childermass seems to disapprove of. He confronts Norrell and doesn’t understand why he is dredging into the Stranges’ personal lives which is far too invasive for him. Norrell seems to tell Childermass his secret – because he breaks into Lady Pole’s rooms and slashes her rather excellent tapestry. Arabella is also visited by The Gentleman who enquires after Jonathan – last episode he seemed almost enthralled by Arabella which is probably a very bad thing. He and Stephen go to Arabella’s house looking for a key to taking her as well even as Stephen protests. But the Gentleman has an excuse for why everyone should come to his house – in Stephen’s case because no-one will recognise his “kingly birth” in the real world – and because in the world of the fae no-one cares that he is Black. He ignores Stephen’s plea of how utterly exhausted he is. Lady Pole is devastated with the destruction of her tapestry – and Stephen advises Arabella to stop visiting out of fear of The Gentleman’s interest in Arabella. They find Lady Pole among her tapestry having slit her wrists. They bandage her and call help and doctors. The Gentleman is bemused by Arabella’s grief and the very idea that Lady Pole experiences horrors that she needs to be pitied over – he also offers to cure Lady Pole’s “madness” but he will need her help and consent. Arabella is made of sterner stuff – if he can help he should do it but to make a bargain of Arabella’s friend is unconscionable. She storms off refusing to see him again without her husband present (clearly she thinks he propositioned her). Lady Pole is reduced to being tied to her bed- and Norrell visits her. He accuses him of murdering her and he accepts that, he knows what he has done, what he was tricked into. He knows it’s wrong but still considers it a necessary sacrifice for the war – she’s collateral damage. He tells her not to tell anyone about what happened, to make no more tapestries – and that she will live another 75 years as she is. She despairs as he leaves her. Norrell then goes to Sir Walter to try and get him to stop Arabella visiting claiming it will upset her. Arabella is now barred at the door – and when Stephen tries to explain he recites nonsense, just like Lady Pole. Lady Pole seems almost resigned to this as she is tied to a chair– and the bell keeps ringing for Stephen as The Gentleman summons him. The Gentleman has returned to the idea of making Stephen a king – or so he says, his real motive seems outrage over Arabella telling him no. He wants King Stephen to kill Jonathon. Stephen makes a desperate plea that he is a king of his own realm and he prides himself on the excellent service he provides. The Gentleman calls him a slave and he angrily denies it – slavery is illegal in England. But even as Stephen protests that Sir Walter’s father was kind and educated and christened him The Gentleman skewers this “kindness” – asking Stephen what his mother called him. Which Stephen doesn’t even know. The Gentleman shows Stephen an image of his birth and his mother – who was a slave. Childermass goes to examine Segundus and Honeycutt’s magician school they’re building and warns them that Norrell will Not be Pleased. They both condemn him for his strongarm tactics. Jonathan arrives in Lisbon and sets off to find Wellington – though most people don’t really have time or inclination to talk to him. He reflects that maybe Norrell is right, maybe magicians aren’t respected enough. Wellington is also not a fan of the magicians, not seeing them helping a lot and believing that Norrell’s visions convince the ministers they know what is happening in the war when they’re still woefully ignorant – but now think they can second guess him. At breakfast Wellington finally asks Jonathan about magic – and whether a magician can kill a man magically. Jonathan admits a magician can, but a gentleman could not. Instead he offers to use magic to create a smooth road. He goes into the hills and creates one with his instinctive, but untutored magic, much to the utter shock and awe of his assistant/servant. Wellington is quite impressed, though it could be a little straighter (oh I like him). Jonathan also objects to being called Merlin – as Merlin is not a respectable figure. Though Wellington is unhappy – he wanted the trees moved, not mist. Still, his second in command does praise Strange for saving their lives with his mist. It’s lucky he’s sympathetic because Wellington isn’t and cares nothing for the friend Jonathan lost or the books that were destroyed – continuing to make demands of him. Jonathan comes to realise how light an idea he had of war and how naïve he was. Faced with a need to question dead prisoners, Jonathan uses blood magic from the Raven King on their bodies to raise horrific zombies speaking the language of hell to be questioned. Wellington is almost horrifically practical about the whole thing while Jonathan is a complete wreck over what he has done. He also doesn’t know how to make them dead again. Oops. The zombies also plead with him not to send them to hell but to send them home to their children (the Major would rather they just let the zombies roam loose since they’ve got other things to worry about). Shooting the zombies doesn’t work either (Wellington objects to him wasting time killing people who are already dead because he manages to be awful and awesome in equal measure). He has absolutely no time or patience for poor Jonathan’s angst. He does find his distraction annoying though – so he has the Major lock the zombies in the mill and burn it down. Of course, all the men are now extremely respectful of Jonathan after this display of power. Of course, the flip side is that to be respectable means nothing (as Norrell found in the first episode) if you are not also effective. He is in a position to care about respectability because he resurrected Lady Pole. Jonathan is in a position to impose what magic he will and will not do during a war because he unleashed his sand horses. Without these flashy and risky displays of power they may be respectable but they are not respected. So we have the ongoing balance of the series – respectability, limits, safety against displays of power and effective application of it. And it’s not just divided with Norrell representing one side and Jonathan another as it was in the last episode with Jonathan stepping up this episode to insist on standards and limits in the more extreme circumstances that the war presents. Jonathan does a lot of growing up this episode seeing both the mundane horrors of war and the place he is demanded to take within it: it’s no longer quite the gleeful adventure he pictured. While Norrell, while questing (high handedly and aggressively for respectability) is at least in part driven by that careless and dangerous magic of resurrection. In effect both Jonathan and Norrell made the same choice – they have standards, they had limits but circumstances pushed them to do things they know they would regret. 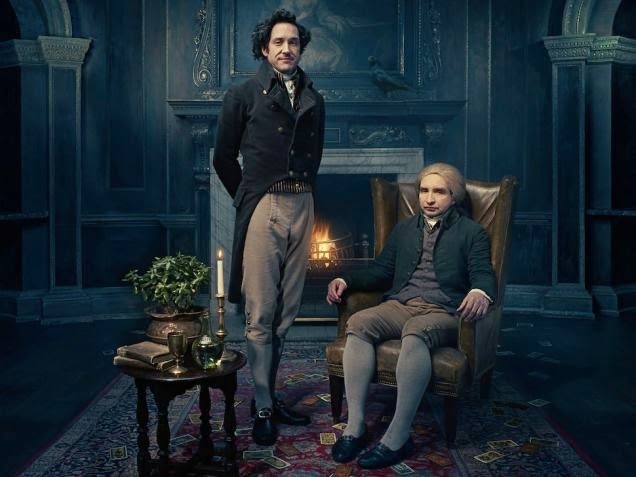 Jonathan begs Wellington not to reveal what he does just as Norrell is doing his best to cover up the consequences of his act – which is the toxic way that respectability and power can interact. Respectability can limit them to sensible uses of magic, but it can also force them to go ahead (and be respected and useful) while trying to cover their shame. Arabella and Lady Pole have an interesting byplay about love. Firstly Lady Pole’s statement that his love doesn’t save her from anything I actually find quite refreshing. In the world in general and woo-woo in particular, love is the great panacea, the end goal, the victory. It cures all (quite literally should you have a dodgy apple source), it is the final act (prince kisses princess, the end, everyone is happy ever after). To have her practically turn round and not DOUBT his love but ask exactly what miracles his love is supposed to solve is quite subversive. Yes he loves her. And? Similarly we have Arabella being very clear over who the actual guidance and real power in her relationship is – and it’s clear she has led, guided and even scolded her husband more than once. The problem with this is the eternal problem of the Manchild trope – the man is immature and inept, forcing the woman into the role of nursemaid which, in turn, either makes her into a “nagging shrew” we’re supposed to regard almost as an antagonist or means all of her storylines are subsumes into the eternal duty of watching her man. Which is a problem with marginalised characters on this show – few, in service or victims or all of the above; I do hope we see them banding together and facing down The Gentleman while everyone else plays their power plays. There is some interesting development between The Gentleman and Stephen, with Stephen angrily rejecting the label of slave but the Gentleman archly pointing out how hollow the “kindness” of his employers actually is: he is not a slave but he is far from equal or entirely free and slavery itself had only recently been banned on English soil. It skewers the idea that banning slavery magically changed everything or that Stephen can be untouched by slavery just because he does not remember it or it is illegal. There’s a lot of levels there – but is it going anywhere beyond making Stephen the Gentleman’s slave?